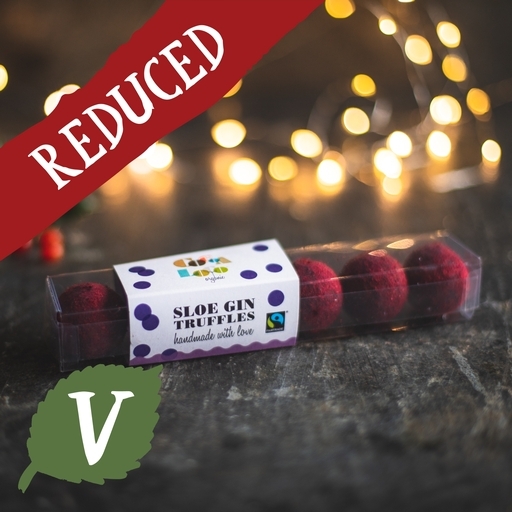 Nearly gone – grab them before they disappear for another year! Creamy chocolate and fruity sloe gin ganache tumbled in pink raspberry dust - these organic truffles from British chocolatiers Cocoa Loco are as beautiful to look at as they are to eat. Enjoy after dinner (if you’ve got any room left), or give as a present to your favourite chocolate lover. Now reduced - previous price £6.65. Milk chocolate (cocoa solids (37%), milk solids (21%) (sugar, cocoa butter, whole milk powder, cocoa mass, vanilla powder)), sloe gin (3.7%), freeze dried raspberry powder.